Dhaka, 18 Jan, Abnews: Prime Minister Sheikh Hasina on Thursday said Bangladesh wants a peaceful solution to Rohingya crisis with its next door neighbour Myanmar. “Bangladesh and Myanmar have already signed an agreement for the repatriation of Rohingyas,” she said. The Prime Minister said this when Director-General and CEO of OPEC Fund for International Development (OFID) Suleiman Jasir Al-Herbish met her at her office. He said, Suleiman highly praised the Prime Minister for giving shelter to Rohingya refugees saying she has accomplished a huge humanitarian obligation by giving them shelter. “Bangladesh is a major partner of OPEC and has a good relation of the last 32 years. 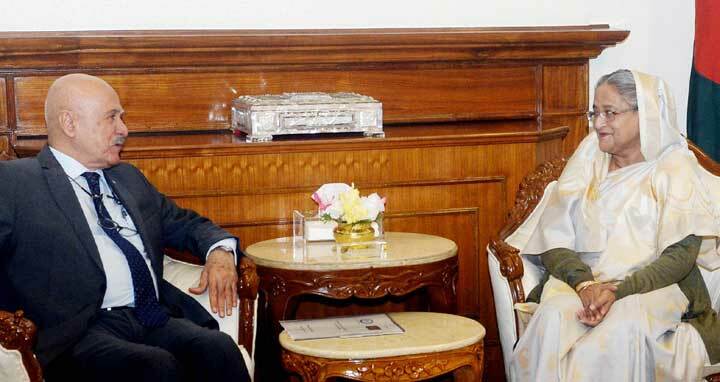 Now we want to explore new areas of cooperation with Bangladesh,” he further added. Referring to the discussion with the state minister for power, energy and mineral resources, the OPEC DG said he would place a report at the council meeting of the organization in June next to do more for Bangladesh. The Prime Minister thanked the OFID Director General for visiting Bangladesh and informed the DG about Bangladesh’s endeavour to meet the energy demand as well. Principal Secretary to the Prime Minister Md Nojibur Rahman was present during the meeting.